Hand hygiene is important: here you will find out why. 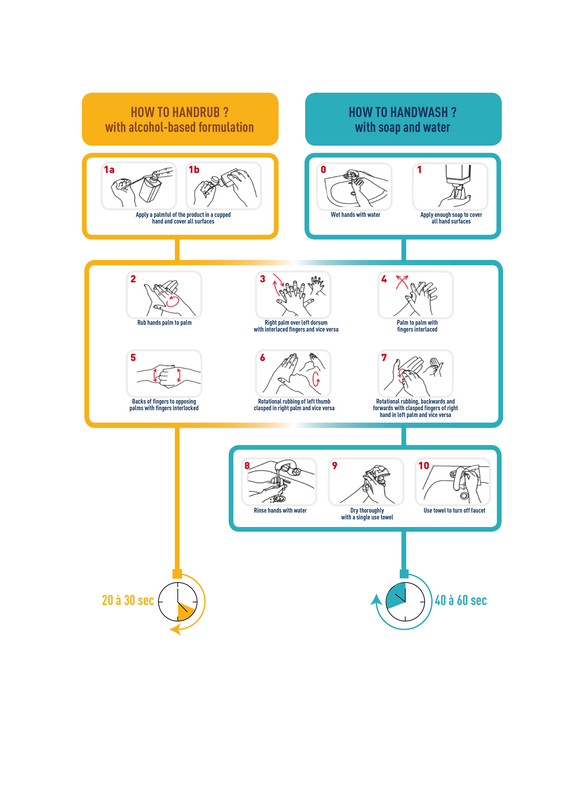 Learn about the different hand hygiene techniques and how and when to apply them. Our hands carry millions of microbes. Most of them are innocent, but some may be harmful. If the hands of healthcare providers are not clean while giving care to patients, disease causing microbes can be transmitted to the patient. Hand hygiene is therefore a very effective and cheap way to prevent the spread of healthcare associated infections. Furthermore, infection prevention implies a lower use of antibiotics. This contributes to the struggle against antibiotics resistance. Not only care providers benefit from good hand hygiene, but you too, as a patient or as a visitor. Indeed, you too can transmit disease causing microbes to other people through your hands. Or you can develop an infection yourself by touching your mouth (e.g. diarrhoea), your nose (e.g. a cold) or your eyes (e.g. conjunctival infection or pinkeye) with your infected hands. What is hand hygiene ? Microbes causing healthcare associated infections are mostly transmitted through the hands. Consequently, healthcare providers need to have clean hands when giving care to a patient. Hand hygiene consists of washing your hands with water and soap, or disinfecting them with alcohol based solution. Applying alcohol based solution is faster, more efficient and user friendly. Hand disinfection is the preferred method for hand hygiene in the hospital. When the hands are visibly dirty, they have to be washed with water and soap followed by disinfection with alcohol based solution. In a hospital setting, washing hands with water an soap is not sufficient. Therefore, healthcare providers need to disinfect their hands using alcohol based solution. When wearing gloves, the hands are protected against contamination with microbes. But even when wearing gloves, hand hygiene remains necessary. Besides, gloves need to be removed (and replaced) at the right moments during care. Proper hand hygiene is important not only for healthcare provider, but also for yourself as a patient or a visitor. Clean your hands before each meal and especially after using the restroom. That is the golden rule! That way, you get contaminated with as little microbes as possible from your environment and you prevent them from being transmitted to other people. In daily life, washing hands with water and soap is sufficient. When is hand hygiene necessary ? Why? Wash your hands regularly with water and soap to maintain your personal hygiene. Are you looking for information on hygiene in daily life for children? Visit the website of ‘Handige Hans’ (for pre-schoolers) on www.handigehans.be and/or the de website of the European project ‘e-Bug’ (9-16 years old) on www.e-bug.eu. Why? Visitors that come into contact with patients need to perform hand hygiene in order to prevent the transmission of microbes. Why? In order to protect the patient and him/herself against the transmission of harmful microbes, healthcare providers have to disinfect their hands with alcohol based solution at specific moments during care. After a risk of exposure to a patient’s body fluids or mucosa: emptying the urine bag,etc. Wet your hands with water and apply enough soap to cover all hand surfaces. Rub your right palm over your left dorsum with interlaced fingers and vice versa. Rub your hands palm to palm with fingers interlaced. Bring the backs of your fingers to the opposing palms with fingers interlocked. Rotational rubbing of the left thumb clasped in the right palm and vice versa. Rotational rubbing, backwards and forwards with clasped fingers of the right hand in the left palm and vice versa. Rinse your hands with water and thoroughly dry them with a single use towel. Apply a palmful of alcohol based solution (about 3ml) in a cupped hand and cover all surfaces. How to handrub and handwash ?